I got some bad news, I don’t think the Mrs. will be joining us this week. See, I make her work 2 part-time jobs, clean the house, do my laundry, cook at least 3 meals a week then when she’s done with all that she’s free to do whatever she wants. She spends most of that “free” time creating hand made cards. If you would like to see some of her artistic creations check out her blog at The Ink Trap. Honestly, I don’t know what the hell she’s doing over there, all I know is that she doesn’t sleep much and she’s really grumpy all the time. So, it looks like you’re stuck with the terse and less entertaining me this week. I will try to liven it up a bit and be more verbose. 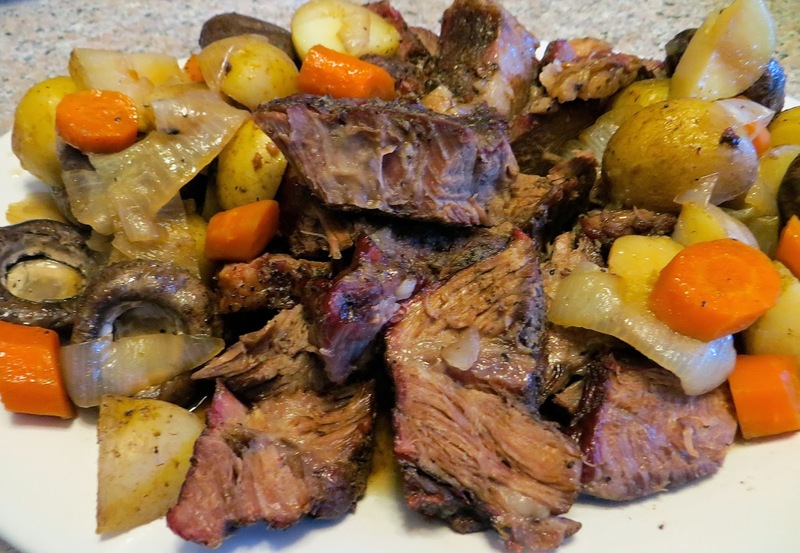 When I was kid there were a few staples of any memorable Sunday dinner one of those was the proverbial pot roast. 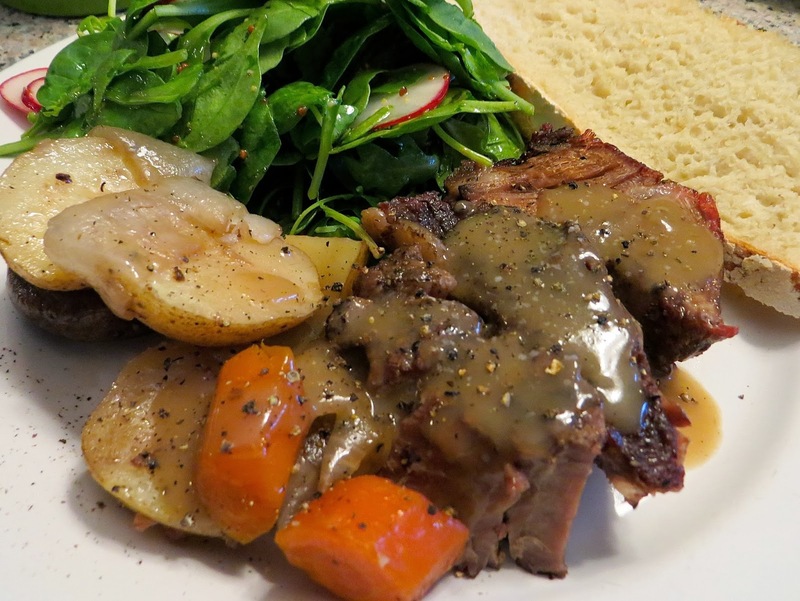 Now, Cheryl and I have been cooking up spectacular Sunday dinners for many years now and I cannot remember the last time we had a pot roast with gravy and all the fixings. If we did have roast Cheryl made it, because I’m way too big for my britches to cook such a simple dish. Well, I decided it was time to get over my bad self and cook up some good old fashion comfort food with a smokey twist. I started with 2 chuck roasts, each about 2.5 lbs. I cooked two because there is nothing better than leftover hot roast beef open face sandwiches, but the real reason is they come in a two pack at Sam’s Club. 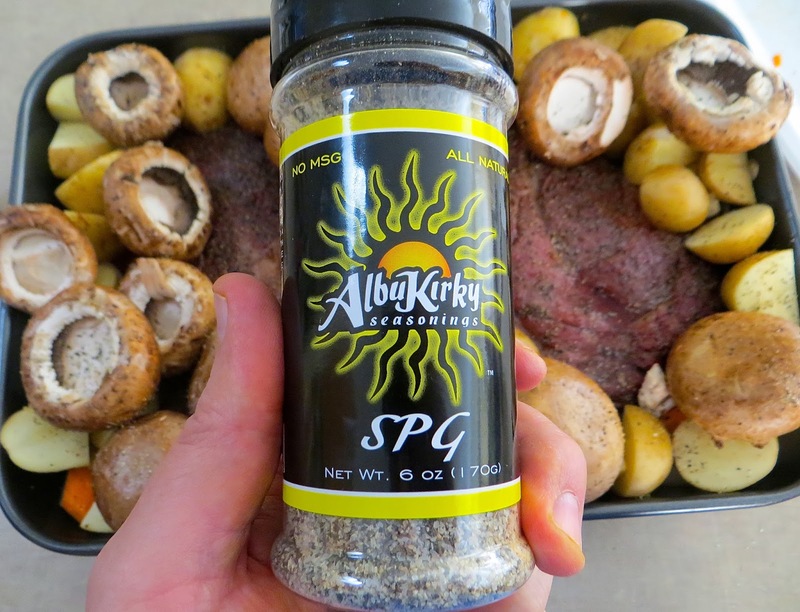 I coated the roasts with a little canola oil and seasoned them with AlbuKirky Seasonings SPG. 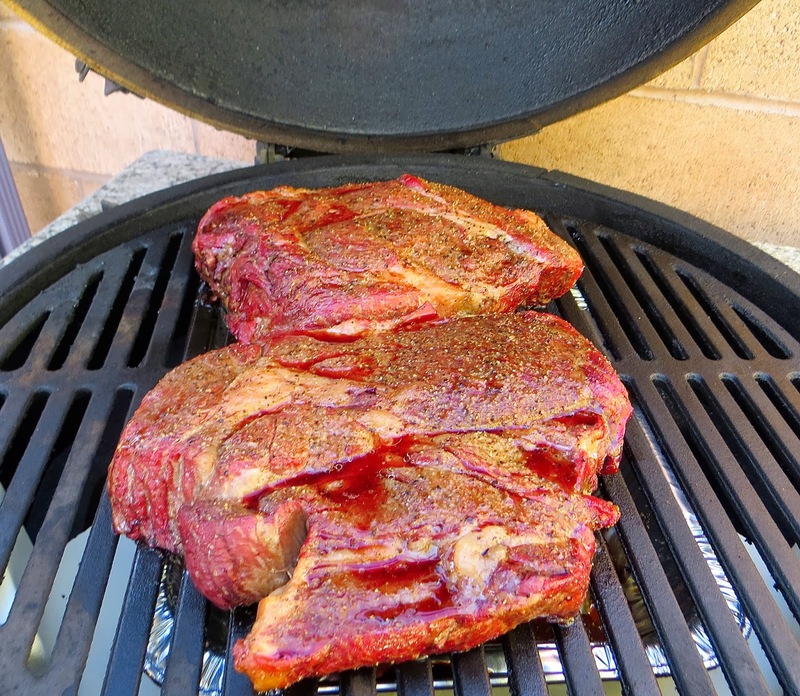 I set up the Big Green Egg for indirect cooking and preheated it to 350º. Once the egg was up to temp I placed the chucks on the grate and let them smoke for 2 1/2 to 3 hours. Now that the roasts have smoked it’s time for the roasting. I placed the roasts in a large roasting pan then added potatoes, carrots, onions, and a few mushrooms. Cheryl likes mushrooms, so I thought I would humor her. Then I added another generous dusting of SPG. Before covering with foil, I poured a cup of beef broth into the pan, then returned the whole thing to the Egg and cook it for another 2 1/2 to 3 hours. When I pulled the roasts off they were 195º and were starting to fall apart. I probably could have let them cook a little longer to 205º, but I was getting hungry and impatient. Smoking the roasts was a great idea if I do say so myself. They had all the great flavor of being oven cooked, but with just a hint of smoke. To smoke these chucks I used my favorite mesquite lump charcoal and the higher heat cooking created a lighter smoke that was not over powering. Also, limiting the smoke time to 2 1/2 hours helped too. Actually, these were so good I’m going to have to add them to the Sunday dinner rotation. As I pulled the roasts of the smoker, Cheryl came home just in time to make gravy and salad to accompany my wonderful roasts. I spent all day preparing a great meal, it was the least she could do, right? Fortunately, Cheryl scored a break when her sister brought over fresh homemade bread. Oh, I almost forgot, Cheryl did make a dessert. It was something called a magic cake, it was really good. I’m just glad she could get home in time to contribute to our Sunday dinner. I have a confession. I have done probably a dozen chuckies on my cookers but I still prefer when Alexis braises them inside instead.